Who: Arngunnur Ýr, 46, of Oakland. 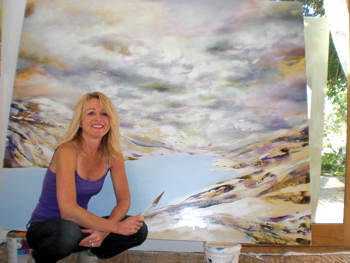 What: She’s a guide in her native Iceland, leading hiking tours in French, English and German, then returning to Oakland to capture the raw nature as a professional painter. How: Her husband and two teenagers often spend summers in Iceland to facilitate her job and her passion. Her paintings are sold to collectors and featured in major museums. She will be exhibiting at Hosfelt Gallery in San Francisco for three weeks starting Dec. 12.